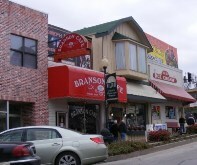 Branson Diners cover a wide range of eateries including the 50's Diner, a mom and pop café, sandwich cafes, coffee shops, chain restaurants and casual menu restaurants. 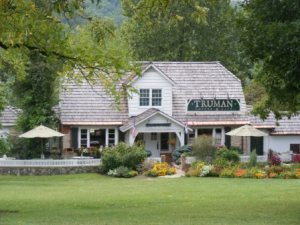 They may feature anything from down home cooking to sandwiches and salads. BLACK OAK GRILL "A Branson Roadtrip Favorite"
CLOCKER'S CAFÉ "A Branson Roadtrip Favorite"
Garfield's has a good sandwich and salad menu with a superb location overlooking Lake Taneycomo. Outdoor seating is available. EAST COAST SUBS "A Branson Roadtrip Favorite"
MEL'S HARD LUCK DINER "A Branson Roadtrip Favorite"
PANERA BREAD "A Branson Roadtrip Favorite"
RUBY TUESDAY'S "A Branson Roadtrip Favorite"
A casual atmosphere is essential in a diner and that allows a rather broad definition of what our Branson Diners will be. 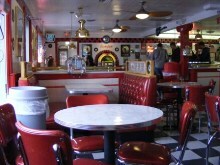 We may think of a 50's style restaurant or a downtown café of our youth but today we would include the sandwich shop, the internet café, an outdoor café, the neighborhood Grille, the coffee shop, tea room, the chain diner, the deli and more. 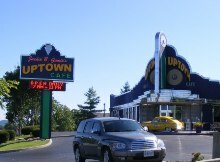 Whatever your definition there are some good diners among the Branson restaurants. They are on nearly every block and most are a fun place to relax, read, surf the internet and of course eat.